Echeveria subsessilis ‘Morning Beauty’ – The Morning Beauty succulent. Echeveria subsessilis is a species from Mexico, with cultivars such as Echeveria ‘Morning Beauty’ being very popular. This is rosette forming succulent, a tidy compact growth habit with typical spoon shaped leaves. It is the blue green rosettes with pink margins that make this such a sought after plant. It grows well in a container, and in good conditions will flower regularly with tall stems topped with pink to orange bell shaped flowers. 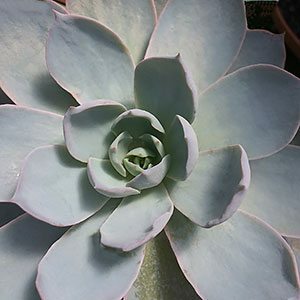 As with most Echeveria, Echeveria subsessilis naturally grows in rocky areas, the drainage is excellent and light is good. In cultivation it is best planted in a specialist succulent and cactus potting mix. It can be grown indoors however it does require bright light to keep the plant looking at its best. Over fertilisation will cause the plant to be pale in colour and fragile. If grown outdoors, a frost free position is essential. Propagation is easy from leaf cuttings. Individual leaves can be removed and simply left sitting on top of washed sand or potting mix. At the end which was cut from the plant, you will see new rosettes, and adventitious roots systems develop after a month or so. The new little plant, with its root system can eventually be removed and potted into its own pot. Soil – Well drained cactus and succulent mix.